Why should you learn Node JS? How do you get started with Node JS? 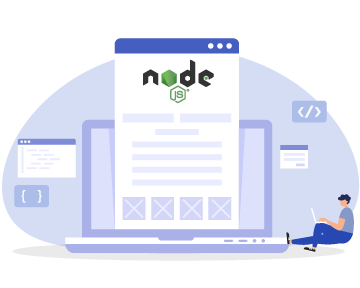 Start on your journey in becoming a Node expert by enrolling in this course that will hand hold you into the world of Node.js and web development. The curriculum designed by industry experts is on par with what is trending right now and gives you the base to apply your skills and knowledge in the industry. You will learn the use of Events, Stream and Modules, how to communicate with databases and test and debug your Node.js applications. You will learn the latest Express application framework and learn to create, deploy and maintain state of the art web applications. By the end of this module, you will learn about how node runtime works and the need for async programming. Create an example of a restaurant which uses async communication pattern for accepting and serving orders. Define a problem and solve the same problem with different async programming styles. By the end of this module you will learn how to modularize node.js code, how to use built-in and third party modules using npm. Create a user defined module that uses built-in, third party and other user defined modules. By the end of this module you will learn how to code event driven node programs, also learn about streams to deal with large volumes of data. Redefine the restaurant module created in module 1 with event driven style. Also log the events to file using streams. By the end of this module you will learn how to deal with file and binary data programming in node.js. Create node program that performs CRUD with file system and also handle global exceptions. By the end of this module you will understand the low level http api in node. Create a web server using http module. By the end of this module you will learn the core features of express js framework. Create a web application and api that uses express features like routing and views. By the end of this module you will understand the importance of security in web apps and how to secure apps using passport.js. Secure the web api built in the previous module with JWT. By the end of this module you will learn how to make realtime applications in node using socket.io. Develop a dashboard application that updates the order stats in realtime. By the end of this module you will learn how to deal with child process and scaling of node apps. Cluster the web api built in previous module. By the end of this module you will learn how to write unit test code for node. Create unit test to the api. The NodeJS training in Toronto was pretty immersive and deep. I was very happy with the kind of support and coordination received from the Instructor. He helped me throughout the course as it was not easy for me to grasp the advanced concepts. Being a beginner, the course suited me because the trainer gave a lot of emphasis on the basics. Overall the training was pretty good. Under the guidance of our trainer, Mike, I learnt everything in NodeJS covering the basics and advanced topics of testing and debugging the NodeJS applications. While doing the project work, he was there helping me all the time. Thank you for the support. I received a constant support from the Zeolearn support team in Toronto. They solved my every query related to the course schedule, trainer details. After the course completion, I am feeling much more confident while working on Node based projects. From past few months I was searching for a immersive and in-depth course on NodeJS. Then I came across Zeolearn’s NodeJS course. During the training, I was enjoying every session because I was getting to code. It was not just one way teaching. The trainer involved us in several activities and discussions. What will I learn during the Node JS training? What would be the objectives of Node JS workshop? The objective of this course is to help you learn the practical aspects of Nodejs. Through our hands on, practical approach, you will get working knowledge of developing nodejs applications that are scalable, performant and reliable. What are the prerequisites for Node JS Course? Do I need to have prior knowledge of HTML and CSS for Node JS training? Who can take up this Node JS Course? Why should I learn Node JS? If you are a front end developer or full stack developer or aspire to be one, then this is the time to master your Node.js skills. JS is an essential building block to learning many front end and back end frameworks including Node.JS, and learning it will make you a multi skilled, much in-demand web developer. Yes, Zeolearn has well-equipped labs with the latest version of hardware and software. We provide Cloudlabs to explore every feature of Node JS through hands-on exercises. Cloudlabs provides an environment that lets you build real-world scenarios and practice from anywhere across the globe. You will have live hands-on coding sessions and will be given practice assignments to work on after the class. How many projects will I create during the Node JS training program? This course is delivered by industry-recognized experts who would be having more than 10 years of real-time experience in Node and web development. Not only will they impart knowledge of the fundamentals and advanced concepts, they will provide end-to-end mentorship and hands-on training to help you work on real-world projects with regards to Node.js. How do I setup the environment for Node JS? Is this live training or pre-recorded videos? This will be live interactive training led by an instructor in a virtual classroom. You will receive a registration link to your e-mail id from our training delivery team. You will have to login in from your PC or other devices. Yes, for all the online public workshops there would be participants logging in from different locations. In case of any queries, you can reach out to us at any of the numbers provided in the link below: http://www.zeolearn.com/contact-us, or send an email to hello@zeolearn.com. If you miss a class, you can access the class recordings anytime from our LMS. At the beginning of every session, there will be a 10-12 minute recapitulation of the previous class. You can watch the online recording and clarify your doubts at that time. You may need to reach 15 minutes before the main lecture begins to avail this facility. Is there a money back guarantee for the training programs? Usually the installments vary from 2 to 3 but have to be paid before you complete the course. Toronto is a big time, vibrant city abuzz with activities. It is home to happening bars, swanky pubs, fine restaurants and eclectic festivals. The flavors, aromas, sounds and sights of diverse cultures converge effortlessly in Toronto. It has emerged as a booming IT hub and offers job opportunities for skilled software professionals including the Node JS developers. Go for the Node JS training in Toronto at Zeolearn. It is known for offering an array of accredited courses in Angular, Hadoop, Node JS etc. Knowledge of modules, like how to use npm for third party modules, as well as reading, writing and understanding streams. In-depth knowledge on how to scale the Node JS applications using the cluster module. Clarity of how to install Express.JS and how to build the web applications using Express JS. Elaboration on how to make scalable network applications and understanding built-in modules. One-to-one mentor led training and learning how to build mini projects. Enroll for the Node JS online course in Toronto on the weekdays or weekends at your convenience from your home. Get in touch with the live online training courses offered by the accomplished instructors with the help of a good internet connection and laptop, smart phone or computer. To learn how to use streams, events and modules and build rapid, lightweight and scalable network applications. To learn how to communicate with databases, test and debug Node.JS applications. To learn how to build powerful, advanced networking applications and communicate with databases. This course is for students, entrepreneurs, project managers, web developers and all those who want to benefit from the course and develop their own applications. We offer corporate training sessions. Pay the most reasonable Node JS training costs in Toronto for group or individual sessions. To have in depth knowledge of application development in any programming language. To be acquainted with the server technology such as J2EE, NET, Ruby etc. is not mandatory though preferred. Contact us right away to schedule Node JS training in Toronto at the earliest. Call us for further queries.